You can tell a lot about people by their online comments, and that's why Disqus believes it could be sitting on an advertising gold mine. The third-party comments service, which runs the discussion section on 3 million websites, is starting to show data-targeted sponsored comment ads. Disqus has 150 million users signed up for its service, which lets people leave comments across participating websites like CNBC, The Atlantic, ABC News, Rolling Stone and more niche sites like SuperHeroHype. Disqus would not specify what publishers would feature the comment ads. The San Francisco-based company mines comments, comment votes and comment context to target ads, which will now show up looking like part of the discussion. Disqus is working with Xaxis, WPP's automated ad platform, to let brands buy ads against the Disqus comments, which will be shown at the top of the discussion threads and marked sponsored. It will be up to publishers if they want to show the new ads from Disqus, and they could share in the revenue. "When people come to a page that has Disqus, we know what they’re reading," said David Fleck, gm of advertising at the company. "We know if they choose to comment. We know what they comment on and know what they say in that comment. We know if they voted on it, and shared it out to social networks." Disqus said its metadata are used to create anonymous profiles against which brands could target ads, without sharing personally identifiable information. "We have the largest and deepest audience profiles on the Web," Fleck said. Brian Lesser, Xaxis CEO, added, "It makes native advertising programmatic at scale. We are pushing the envelope of what is possible within the world of programmatic." It remains to be seen how commenters—who are notoriously fervent—feel about the ads. They will get a chance to comment right under the sponsored messages. Disqus and Xaxis said discussions will be vetted for any unsafe topics before delivering ads to a particular comment thread. 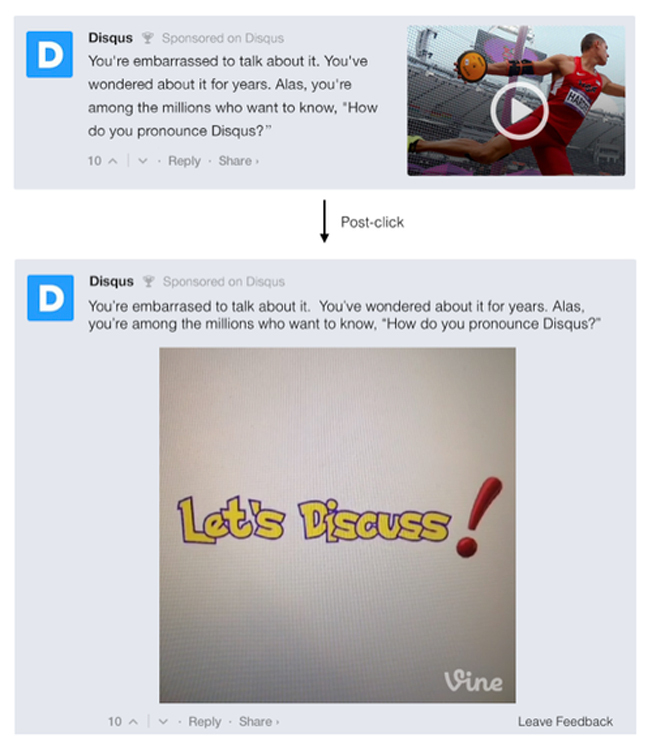 Adweek also uses Disqus for its comments, but does not have plans to run the sponsored comment ads.